In my last post I started with Annie Newsome and could not find much on her so I moved on to Dr. Arthur McKinney. There was another resource I could have tapped, but didn’t think it would have anything for me, the Recorder of Deeds. Because the Northwest Cooperative sits on the square where Ms. Newsome’s house sat, I was unsure the city would have those records. Well lo and behold, once I figured out the lot number, it was easy to find the Newsome house records. In the 1940 census Ms. Newsome claimed to be a widowed woman of 53. Prior to that, in the 1930 census she claimed to be a married woman, who had been married for 24 years. Well according to the image below, she may have lied about that. 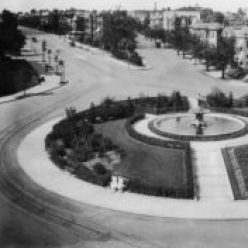 She bought the house as an unmarried woman in April 1925, from widow Francesca Garaci. So 5 years later for the 1930 census she’s been “married” for 25 years. I believed that she lied to the census taker, as she had two married families living in her home as lodgers, and probably did not want to lose respect in their eyes. She also probably lied about her age. In the 1940 census she was 53 years old. In 1930, she reported being 47 years old. I’m not particularly good at math, but if she was correct in 1930, she should have been 57 years old, not 53. If she was telling the truth in 1940, then she should have been 43 in 1930. Big deal you might say. Well, when trying to find someone in the records, the misinformation of birthyear and marital status can send a person barking up the wrong tree. Women, and I write this as a woman, can be difficult, especially when we move around, change our name because of marriage or divorce or remarriage, and lie about our ages. I’ve changed my name, moved around and got married. I’m vague about my age now. Enough about me, back to Ms. Newsome. 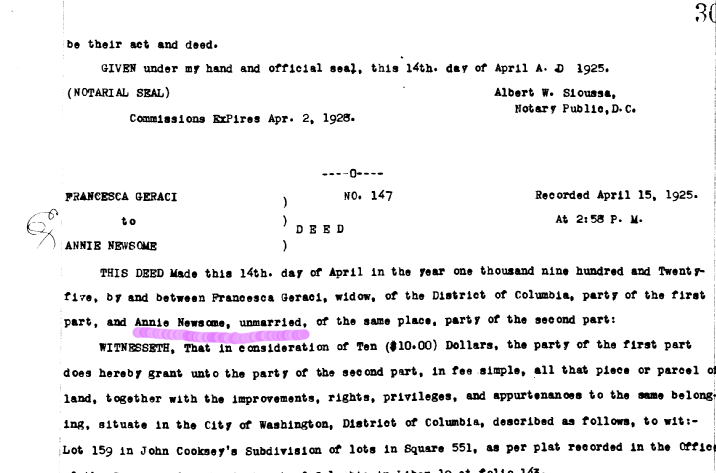 Annie Newsome, owned the house at 1616 First Street NW from 1925 to about 1943 when she sold it to the Embassy Dairy. Embassy Dairy was her “neighbor” of sorts on 1st St NW and it appeared they were expanding. From 1943 to 1950 Embassy Dairy Inc bought out her neighbors. That same year, Ms. Newsome’s next door neighbor Ophelia Hurd at 1618 1st St NW, sold her home to the dairy. She was listed as a widowed woman in both the 1930 and 1940 census. She probably bought her home prior to 1921, which is how far back the Recorder of Deeds resource goes.